Central Seoul is expected to suffer heavy traffic congestion Saturday, as more than 40,000 people are expected to participate in various rallies in the city, the Seoul Metropolitan Police Agency said. 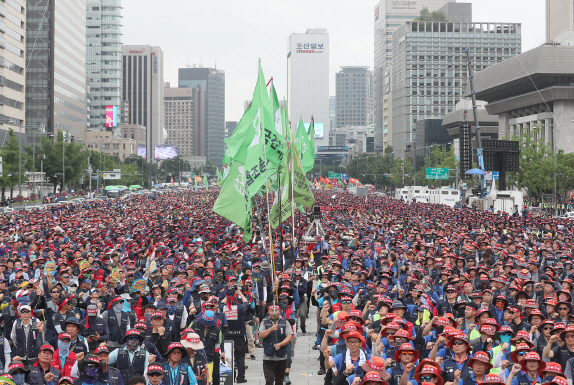 The Korean Confederation of Trade Unions, an umbrella labor group, will hold a workers’ rally in Gwanghwamun Square from noon to 7 p.m. Police said some 40,000 workers from around the country will gather to protest and march from the square toward the gate Daehanmun in front of the palace Deoksugung, across from City Hall. On the same day, around 4,000 supporters of ousted President Park Geun-hye will gather in front of Seoul Station to demand her release. The pro-Park rally will march from the station toward the Sejong Center in Gwanghwamun via Namdaemun, occupying three traffic lanes. More than 20 other smaller protests are scheduled to be held in the center of Seoul. Police have advised the public to use public transportation.